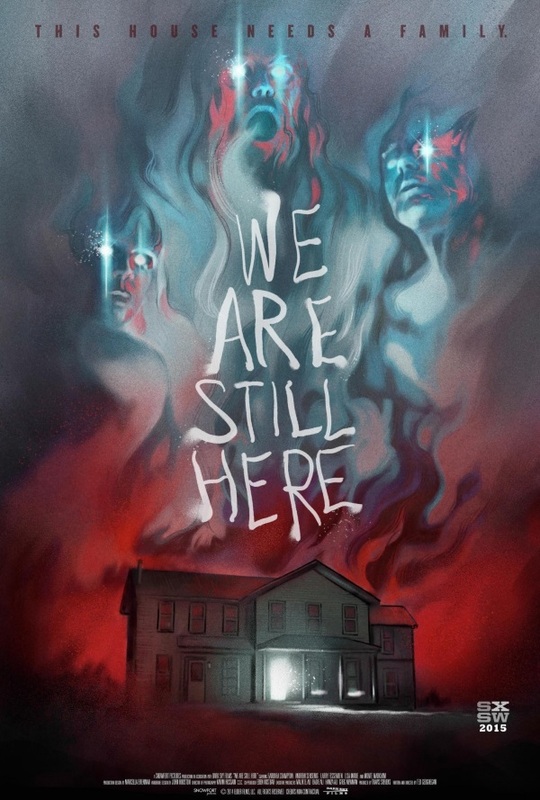 “We Are Still Here” starts off rather formularic, and even though it slighty shifts gear towards the end, it ultimately proves that “formularic” doesn’t necessarily have to mean “bad”. From the get-go, what really stands out is the incredible tension that Ted Geoghegan builds whenever we’re in the house. He perfectly combines quiet, suspenseful scenes with clever, well-built and highly effective jump scares (I might not be their biggest fan, but have no quarrel with them if they’re as well-made as they are here). I also loved the design of the “family” – as someone who doesn’t know every horror movie ever produced in and out, it looked and felt quite original, and it was also nicely alluded to with the heat and the smell in the basement. What also sets this apart from other, similar movies is that the main protagonists aren’t some teenagers or a young couple that movies in to start their life together, but rather a slightly older couple who have just suffered a terrible loss and now want to start a new life and leave this tragedy behind. As my dear blogger-friend Maynard said, a more mature couple reacts totally different to something like this than younger ones. I also liked that it was set in 1979, immediately – and quite cleverly – eliminating problems of modern horror movies like “Why don’t they use their cellphones?”. The last thing that stood out for me is the fact that after a creepy, effective beginning, “We Are Still Here” turns into a bloody gore-fest – something that, as least to my limited knowledge, is rather unusual for a ghost house-horror movie, and which totally surprised me (but not in a bad way). The only things that I’d critisize are the slightly clichéd reactions of the towns people in the bar/restaurant (even though, as we later find out, they have a very good reason for reacting the way they did), as well as the rather swift disposal of two certain characters (you should know whom I’m speaking of if you’ve seen the movie). Other than that, though, it was an incredibly creepy movie, with lots of cool ideas, great individual moments, some stunning cinematography, a nice suspenseful atmosphere, lots of well-made and highly effective – but never cheap – jump scares, some more than decent acting, and a couple of intensely scary scenes that had me on the edge of my seat. Highly recommended! This entry was posted in /slash, movie reviews, new releases and tagged /slash, /slash 2015, Barbara Crampton, horror, Ted Geoghegan, USA, We Are Still Here. Bookmark the permalink.